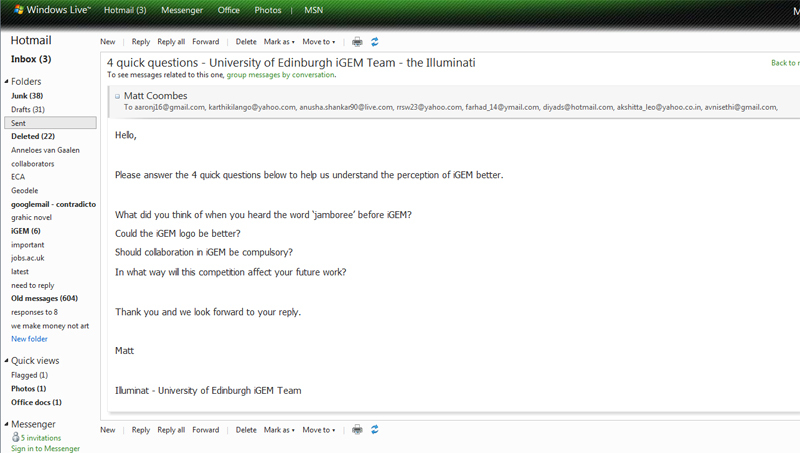 The following email was sent out to as many iGEM team members as possible. Below are some examples of responses to the four simple questions. These questions were designed to be quick and easy so as to get the most responses back possible. They could be useful in several ways for teams and perhaps even for iGEM itself. What did you think of when you heard the word ‘jamboree’ before iGEM? "Nothing; I checked the meaning at dictionary". "That jamboree does not fit to the huge ammount of work from the last few month". "Boy scouts as i think it's the only context i've heard of it being used". "A hip coffee, for some reason". "big and maybe noisy party"
Could the iGEM logo be better? "Definitely, I think it can be better designed, with something more appealling than a cell and cogs. Besides, I think the colors could be changed to get a more professional and appealling look". Should collaboration in iGEM be compulsory? "Yes I think is part of iGEM spirit; no only get a colaboration but interaction between teams". "No. My opinion is that as a competition individual groups are working towards their own goals. To collaborate with another group blurs that definition of which group is competing under what aims. At the same time, I think it's important to cultivate an ethos of sharing and collaboration as the Science we do could not progress if people didn't share their work and ideas". "I do not think it should be compulsory, but it could be encouraged". "I think that the collaboration is one of the aims of the competition and leads to a fast development of the field. So, I think that it is good the compulsory collaboration". "No, I think every team knows if they want to collaborate or not, it's up to everybody to decide". In what way will this competition affect your future work? "It's been a great lab experience and given me a head start to my industrial placement. It has also given me a general idea of what it's like doing research and the effort needed to carve a career out of it. In terms of the subject, it's made me aware of the field of Synthetic Biology although i'm not convinced it's an area that i would like to work in". "Know how to communicate with people from different field to accomplish a project, and get to make more friends". "It'll definitely open many doors professionally for me, because of the experience I've gotten, the contacts I've made and the fact that I'm part of this huge event". We received a huge response from this questionnaire from all over the world. The examples above are just a small sample of the replies but it shows the variation in opinion about these subjects. There was the occasional issue with language and understanding what was asked, which is partly our fault for not taking that possibility into account when the questions were written. We will now go through each question in succession and give my interpretation of the results. The use of the term 'jamboree' initially annoyed some of us, it seemed almost patronising. Like one of the examples above all we could think of was a Scout's camp. But we soon realised that not everybody in the team had quite the same reaction. This, in combination with the idea of branding and perceptions, motivated us to conduct this survey. What is the perception of iGEM? As you can see even from the above, the results are mixed. It shows that one cannot take one's own perception of things for granted, there is always another. Through discussions amongst the team it quickly became clear that an alternative is extremely difficult to find considering the context it is found in. Secondly, there has been talk about iGEM breaking up into regional competitions. This, as well as an awareness of a mature design student branding is important to the growth of an organisation, lead me to question the face of the iGEM brand, that is largely, the logo. The question of, could it be better, is a seemingly uninformative, mundane query but the responses have consolidated the impression that this competition is not aimed at professionals despite the need for them to be involved. The importance of a logo can be easily underestimated. When one doesn't focus on them in general why in this case? Well, despite a lot of people not having any issue with the logo it is often the case that when one doesn't have much knowledge or experience in quality they don't realise the impact it can have. In saying this the question of the audience or market remains, who is it for? Thirdly, collaboration has become an interesting aspect to iGEM. There has been debate within our team whether it should be compulsory or not, hence this question. The general consensus seems to be that it should be encouraged, possibly more than it is now but not that many people think it should be compulsory. For some it's more about the competition, others have needed collaboration, and others still simply desire it for the sake of progression. Finally, what effect is this competition is having on the people involved. Everyone tends to be positive in some way, stating that they have got something out of it. For some it has encouraged a change in academic career, for others it has solidified enthusiasm for synthetic biology that was already there, and for others still it has made it apparent what they don't want to do. All the information sent back from these questions has given us a feeling for perceptions of iGEM and what it is like to be part of it. Maybe it could even help the organisers of iGEM in some way.